Considering an Alliance with a Recruiter or Other Referral Source? Have you ever considered developing a formal relationship with a referral source -- a recruiter, headhunter, career coach, mental health therapist, even a Realtor® -- but didn't know where to start? "Developing Strategic Alliances and Partnerships with Recruiters." This information-packed report is designed to give you an in-depth guide to develop and structure these relationships -- from finding prospective referral partners to coming up with a compensation structure to things you should include in a Letter of Agreement or contract to ensure the relationship begins -- and ends -- the way it should. The more risk you take on (i.e., investment in materials, free programs for the recruiting firm's clients), and the more resources you commit (developing custom forms and templates, meeting with clients at the recruiting firm's offices because that is more convenient for them), the greater the share of the project fee you should reap. If you are collecting the fee vs. if they are soliciting the funds and then paying you (thus allowing them to "use" the money in the meantime). If it's up to you to structure the agreement, write it in such a way that is favorable to you, and be prepared to negotiate the details, if necessary. As a general guideline: The more resources you commit to the project, the greater your share of the project fee should be. I conducted interviews with resume writers who currently are in strategic alliances and/or partnerships with recruiters or headhunters and there are also five case studies in the report detailing their experiences. Report also includes Frequently-Asked Questions. 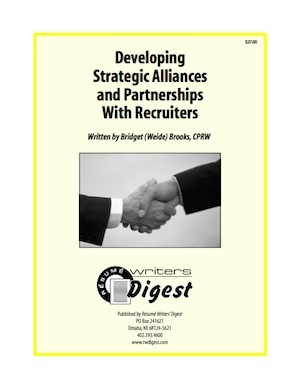 The "Developing Strategic Alliances and Partnerships with Recruiters" special report is just $27 and is available for immediate download. It's February....which means it's tax time. I'm slooooowwwwlyy working on my tax stuff for my accountant... and it reminded me of some important questions you should be able to answer about your resume writing business. If you don't know the answers to these questions, you should!! What are your current annual and monthly net revenues (gross revenues – expenses)? What are your net revenue goals and are you on track to meet them based on your current gross revenues and expenses? 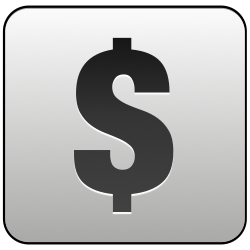 What’s your current marketing budget? What’s been your most successful marketing tactic based on Return On Investment (ROI = Gross sales revenues generated – time & money costs of implementation)? What’s the average value of one new client or sale? What’s the annual value of a client or customer (average value of one new client or sale X average # of annual sales per client or customer)? How many sales, customers or clients do you need to meet your goals (gross revenue goal / total average sale)? Yesterday, I offered a free special report for resume writers on using Pinterest ("Resume Writers' Guide to Pinterest"). Pinterest is just one of the social media sites (along with Facebook, Twitter, LinkedIn, YouTube, among others) that can drive traffic to your resume website and/or blog. It's no secret that search engine rankings are important -- many prospective resume clients start their search for a resume writer online. Search engine optimization is necessary if you want to achieve any useful ranking that can impact your resume business in a positive way. It can take months and even as long as a year or more for websites to achieve the coveted spot on the first page (or even the first spot!) on a search engine. To speed up that process, you can take a look at social media to increase your visibility. Google is now considering social media stats in their overall algorithm for website rankings. The good news is that many of us use social media anyway, so turning it for business won't be a stretch. You can use your knowledge and the keywords from your website to help you attract other social media members who are in your target market. Here are a few tips to help you utilize social media to improve your SEO efforts. Join the social networks that matter -- There are several social media sites but the ones most used are Facebook, Twitter and YouTube. Establish personal (if you haven't already) and business profiles on each of these sites. Within your profiles, incorporate the target keywords that you use on your site to attract visitors. Utilize every area of these sites -- Link updates on your website to posts that you make on these sites. Uploading a video to YouTube? Use keywords in the description and add a link to your site. "Like" pages that are similar to your niche market. Join sites relevant to your target audience -- This is an old one but a good one. For instance, when you sign up for community forums (like a Group on LinkedIn), become an active member. Two-word comments, or posting to promote your site, can be viewed as spamming. You will gain more traffic from other members and influence in the community if you genuinely participate. Follow other relevant blogs -- Make comments, offer to guest blog for influential bloggers in your niche (for example, if you are a resume writer who works with CFO candidates, find bloggers who write about business-to-business financial topics), and offer useful information. The more engaging that you are on social media sites, the more you will rise to the top on the lists of others who also patronize those sites. This can elevate your status and increase traffic to your website. Also, communicating with your target market here can offer valuable insight for prospective clients, increasing your status as an expert for them when it comes time for them to conduct their job search. The Resume Writers' Digest Annual Industry Survey is an opportunity for resume writers to benchmark their progress compared to their peers. The survey was first conducted in 2001. The majority of responders were full-time, self-employed résumé writers (65%), with another 23% classifying themselves as part-time entrepreneurs. While most worked from home (71%), another 16% also met their clients elsewhere, such as coffee shops or libraries. Only 11% chose to maintain a separate outside office. January was a busy month for 42% of résumé writers, followed by February (15%) and March (11%). It tapered off from there with spikes in May (8%) and August (9%), with very little activity during July or December. 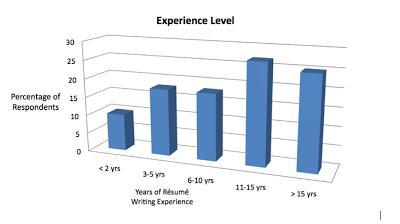 On average, the vast majority of writers (80%) produced fewer than five résumés a week. Seventeen percent wrote more than that, but only 3% wrote more than 10 résumés a week. Perhaps the hardest part of writing any résumé is simply getting the client to give you enough material. Some writers reported using questionnaires, either all the time or occasionally, in an effort to extract information (19%), but 25% never did. A slight majority preferred to use both a questionnaire and talk to their client in person or over the phone (51%). The trend towards working virtually continues to grow. While 30% of writers still met with clients personally, 28% also used phone, fax, or Internet, and 10% conducted all their business online. For many clients, a résumé itself isn't enough. While 32% of writers were only tasked to prepare the résumé itself, another 24% also provided a cover letter, and a further 11% added references and other supporting documents. Ten percent were required to present their résumés in alternate formats (ASCII, PDF, etc.). Unexpectedly, interest in brand and social media development has declined a couple of percentage points since the last survey, although at least one respondent included a LinkedIn profile as part of the standard résumé package. To avoid later difficulties collecting their fees, most respondents required full payment up front (61%), but a minority 19% contracted for an initial deposit, then the balance upon delivery. A very small number completed the project first, and then received payment (6%). Estimates of hourly wages varied considerably, with 43% listing $50-99 as their average wage, 32% listed $100-199, 20% made less than $50/hr, and 5% claimed to make $200-300/hr. Not all income was generated directly from résumé writing. Of those respondents who reported passive income streams, 35% received money from their own ebooks and products and 25% received affiliate income (Amazon, ClickBank, referral fees, and commissions). As in 2010, referrals (18%) and personal websites (14%) continued to be the most important source of new clients. The next most likely source came from directories on professional association websites (8%). Alliances, recruiters, and social media (split almost equally) accounted for another 17% of new projects. Most writers recognize having credentials is important when establishing credibility with a client. A majority (67%) of survey participants held résumé writer certifications, with 28% also being certified career coaches. A notably large number, however, held no certification at all (29%), an increase of 8% over the previous year. Résumé writers received training or chose to belong to a variety of organizations, with no single association predominating. Professional Association of Résumé Writers & Career Coaches (PARW/CC) and Career Directors International (CDI) accounted for most affiliations (16% each), with the National Résumé Writers' Association (NRWA) (12%) and BeAResumeWriter.com (10%) coming next. Career Thought Leaders and the Resume Writing Academy also had small followings. Many respondents advanced their careers in 2011 by attending professional seminars, webinars, or conferences (36%), purchasing career-related books (10%), exploring strategic alliances (7%), or making new connections with a recruiter (6%). Others promoted themselves by working social media (9%), overhauling their website (7%), giving a presentation (7%), writing an article (6%), or being interviewed in the media (5%). 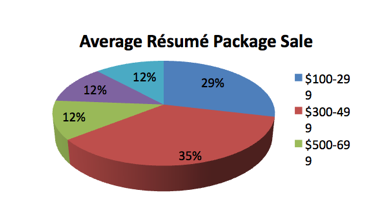 Complaints from the 2010 survey were mirrored in this one, as problems with client management continued to top the list as the least favorite parts of being a résumé writer. Common complaints: Clients don't understand the value a professional brings to writing their résumé; they fail to provide enough information; they don't follow up with revisions or make timely payments; and they don't understand a good résumé doesn't just appear overnight. The marketing and sales aspect of being an independent contractor also weighed heavily upon some respondents. The work wasn't steady...so neither were the paychecks. Deadlines and scheduling conflicts were constant issues, as was working evenings and weekends. Keeping up with changing technologies was difficult for some writers; others had trouble with bookkeeping. Not surprisingly, these difficulties were reiterated by respondents when asked what their greatest challenges were. The business aspect continued to be a prime concern, particularly finding clients and getting them to participate in the process; business development and marketing; and keeping up with current technology and social media trends. Respondents repeatedly commented how difficult it was to manage the ebb and flow of this business and how they needed to improve their time management skills. As the economy slowly picked up, so did the effort job seekers put into their search. The majority of résumé writers (65%) reported increased volume and/or profits in 2011, while a smaller segment did worse (22%). Thirteen percent reported no significant change. 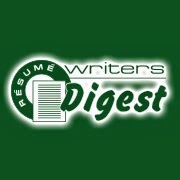 The 2012 Resume Writers' Digest Annual Industry survey will be conducted early in 2013. Be sure to participate! I was stuck tonight writing a cover letter ... so I pulled out my trusty inspiration book. I started the inspiration book while I was subcontracting a few years ago. When you're writing 7-10 resumes a week, sometimes you just get "stuck." You look at the blank page and nothing comes to you. I address the syndrome of the blank page in my "Write Great Resumes Faster" book. One of my best blank-page busters is an inspiration book. Divided into sections, it addresses the common challenges with a resume -- the qualifications profile, achievement bullets, core competencies (for keywords), cover letter openings, cover letter bullets, and cover letter closings. Obviously, you don't want to just cut-and-paste into your resume and cover letter documents. But sometimes just reading through some of your previous work will help create the inspiration you need to break through the blank page. How to create your own inspiration book? 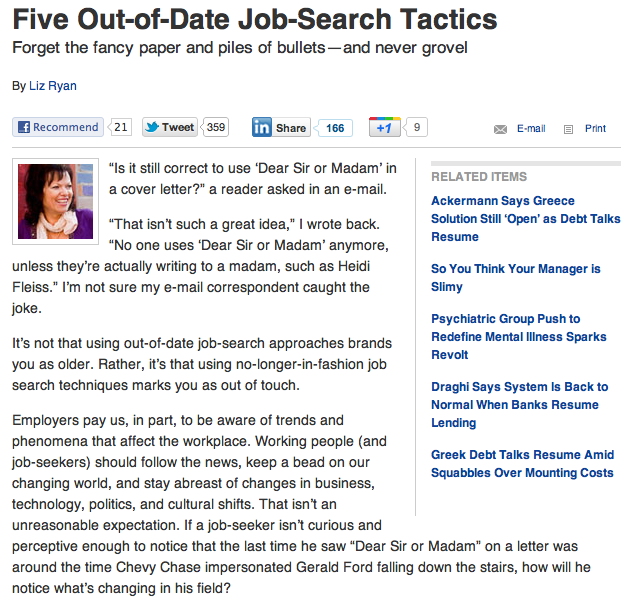 Cull through your past resumes and find turns of phrases that speak to you ... or, absent that, just copy and paste a variety of phrases and pieces. I find a three-ring binder works well to organize your information, although you may find that keeping a Word document or using an app like Evernote helps you access the information you want. I talk often about resume writers who trade "hours for dollars" -- if you're only writing resumes, you're missing out on the opportunity to create passive income and recurring revenue that can put a couple of extra dollars in your pocket each month -- or completely ease the peaks and valleys of resume writing by providing steady, ongoing income...even while you sleep. Sounds great, huh? When some people think of multiple income streams they think of "get rich quick" schemes that do nothing but take your hard-earned money. However, there are some easy, effective ways to create multiple streams of income in the careers industry. Work with multiple clients simultaneously. It's hard to maximize your income when you're working with one client at a time. After all, there is only one of you, right? But have you considered offering groups or workshops? For example, Tina Kasklak Nicolai of Resume Writers' Ink is offering a "Do-It-Yourself Resume Writing Workshop" next month. For $50, she can work with a whole roomful of folks for a couple of hours (and some of them are likely to hire her to write their resumes, once they figure out how hard it is to "Do It Yourself"). Income potential: $150-$1000. Set up a blog. Blogs are not only a good place to communicate with your market, but also a place to earn a bit of extra income. Find ways to monetize it. (Affiliate links, Google Adsense, links to Clickbank programs, and selling ebooks are just a few ideas.) Income potential: $5-$200/month. Take a part-time job. If you're just building your resume writing business, or if you're struggling to make ends meet, consider taking a part-time job -- especially one in the career services field. Your local university may have a need in their career services office for someone to work part-time. Other possibilities include: employment offices and recruiting firms, government career services, or local nonprofits that serve jobseekers (like Goodwill). It will take a balancing act to get everything done each day, but you will have that security of knowing your bills will be paid and your family taken care of until you can leave that job for good. Income potential: $500-$2000/month. Create a product of your own. Maybe an ebook or workbook on a topic related to the job search. 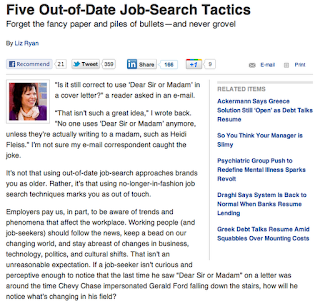 (Instead of doing a "general" book, however, I recommend something more specific -- for example, resume and cover letters for the specific niche you serve, or a job search guide for your geographic area, listing major employers, job search groups, employment resources, temp agencies and recruiters, etc.). You can sell your information product on your website, blog or on another site for greater exposure. Read "Making Money Writing Ebooks" -- it's January's "Special Report" for bronze members of BeAResumeWriter.com. Income potential: $25-$500/month. Start a Career Membership Site. Create passive income and/or recurring revenue by providing membership programs on careers-related topics. I have an 8-day LinkedIn training program that sells for $15. Once you set it up, it runs itself! Income potential: $15-$1000/month. Affiliate marketing. The best thing about affiliate marketing is that the person with the product gives you all of the tools that you need to promote their product in your affiliate toolbox. This makes it easy for you to begin taking advantage of this stream of income. And, your revenue can grow as your business grows. Possible affiliates include ResumeSpider, Allison & Taylor, and multiple products in the Clickbank Marketplace. Check out this blog post for more details about affiliate marketing. Income potential: $10-$300/month. Are you looking to have more than one source of income? Put one or more of these ideas to work for you today! They say: (Avoid) "Gratuitous Research." This one cracks me up. 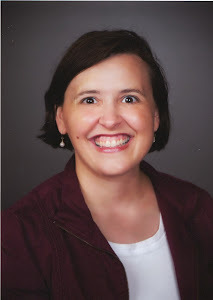 Apparently, the author feels you can be "too prepared" for a job interview -- and that, rather than coming across as an informed, intelligent, interested job seeker, she thinks that looks like "brown-nosing." Really? And yet, in that same section, she advocates looking at LinkedIn, ZoomInfo, and Glassdoor to prepare for the interview. So which is it? I think it's a fine line. A job seeker can't point out that they prepped for the interview by "spending the weekend researching the company"? That's "groveling"? I think that's showing that the job seeker takes the interview seriously. I think you can "advance a business conversation" by referencing where you heard about the "Acme Explosives-Toontown Motors merger" -- you might find the hiring manager has some insight into the author of the article you read -- particularly a bias from the article's author that may not have been apparent to the casual reader but that impacts the inference in the article. All in all, this article underscores the problem with a lot of the mainstream media articles aimed at jobseekers today. There is a need for careers-related content (as I point out in my "Feed the Media" teleseminar -- available in the "Free Level" of BeAResumeWriter.com), and unfortunately, that leads to a lot of mis-information being spread as "gospel." But it's up to us as careers industry professionals to speak up and refute mis-information when we see it.